This was the question posed by the Roman poet Juvenal in the late 1st and early 2nd centuries AD. This was also the problem explored by the philosopher Plato in The Republic. Though the latter asked in the context of patriarchal marriage fidelity, it has been referenced by Plato and many others thereafter in the frame that it is literally translated: Who guards the guardians? Juvenal asked the question, if a husband is unfaithful to his wife, how can he prevent himself from being unfaithful to her? His question: Who will watch the watchman? With Plato, though he did not directly ask the same question, he talked about a guardian class that protects society and how to manipulate the guardian class to guard themselves against themselves in the form of a “noble lie” that convinces them protecting against themselves is for their own good. On Wednesday, December 3rd, a New York City Grand Jury released a decision to not indict Daniel Pantaleo, the NYPD Officer that was responsible for the death of Eric Garner, a black man accused of selling a loose cigarette and was killed when Pantaleo attempted arrest. Within weeks prior to this Grand Jury’s decision, a Grand Jury in Saint Louis decided to not indict Darren Wilson, a Ferguson, Missouri police officer that shot and killed 18-year old Michael Brown who was also black. Days before, Cleveland police officer, Timothy Loehmann shot and killed 12-year old Tamir Rice, after it was reported that a black male was waiving around a gun. The gun happened to be a toy and after reporting that Rice reached for his waist when he was ordered to put his hands up, a videotape was released that showed Loehmann shooting Rice, upon arrival, just as soon as he could open his car door. These three deaths are only the latest in a history that has seen countless others killed and justice for these deaths in question. Trayvon Martin, Oscar Grant, Sean Bell, Amadou Diallo, Patrick Dorismond, Jonny Gammage, Ousmane Zongo, Tim Stansbury, Wendell Allen, John Crawford. These names only begin to scratch the surface of those that had their lives taken away and the families looking for accountability. Accountability from the guardian-class itself, the American Justice system. For decades, Black folks, black men in general, have had a contentious relationship with law enforcement. Thousands, including myself have told stories of arrest, detainment, searches, stops, assaults and aggressive conduct precipitated by law enforcement at a level that eclipses every other ethnic and social group or classification in America. This has, in turn, caused many within the Black Community to lose their trust in law enforcement and a justice system, which is set up to serve their interest. Unfortunately the evidence to the contrary is damning. It’s extremely hard for me to put into words exactly what this nation has been through over the last several weeks. But we have seen a range of emotions and a range of protest with a wide range of persons involved. And as much as I would like to believe that America and its multitudes of people have turned a corner or woken up to atrocities that have been happening for decades, but we’ve seen this movie before. Literally. The deaths of Eric Garner and Tamir Rice might be on tape and we can CLEARLY see what happens to them, just as we clearly saw the lack of accountability by the authorities to prevent these deaths from happening. However, 23 years ago, we also saw a collective of LAPD officers nearly beat to death an unarmed Rodney King and we also saw what happened when there were questions of accountability. Unfortunately, that wasn’t the first time America saw shocking abuses of authority against Black Americans. The nation had it’s darkest visual of such tyranny 26 prior to Rodney King’s beating with the March from Selma across the Edmund Pettus Bridge, nearly 50 years ago. Though those imagines were seared in the minds of millions across the country and it lead to the passage of the Voting Rights Act later that year, those state troopers responsible for beating and hospitalizing marchers and killing Jimmy Lee Jackson would hardly face the level of accountability that their brutality demanded. The moral of the story is that it KEEPS happening. Incrementally, things are changed, laws are passed. However, Black Men are still targeted. Black Americans who make up just 13% of the overall population represent nearly 33% of the arrest related deaths at the hands of police. Similarly, a report released by the Justice Department showed 13% of black drivers in America were pulled over in traffic stops in 2011, compared to only 10% of whites, despite obvious population differences. This would make black drivers 31% more likely to be pulled over than their White counterparts. What’s worse? Black drivers are more likely to be pulled over is for alleged defects or record checks than speeding. More troubling, twice as many Black drivers are given no reason at all for why they were stopped than White drivers. Additionally, White drivers were less likely to be searched than Black drivers. Over the years, these numbers have not changed. And despite the sense of awareness raised by sensational events like the death of Michael Brown, Eric Garner and Tamir Rice, much like Rodney King and the Selma marchers before him, Black Americans will still be left questioning whether or not we can trust authority. 2,000 years ago, Plato explored the reason why those with power are responsible with the power they wield. Naturally, for a society to survive there is needed a guardian class to protect the society from each other and from outside agitators. However, he theorized the only way for this guardian class to protect themselves from the guardians itself is for them to believe they have a greater responsibility that sets them apart. What we are seeing today, factions of our guardian class that has not been as responsible as we would like. At least from the point of view of much of Black America. Of course compliance and respect for law enforcement is universally taught to all, however, every Black man in America knows that no matter their level of compliance, they are still subject to a level of scrutiny that breeds discomfort. Unfortunately, time and time again we see that even when these watchmen are watched, the results have not changed this scrutiny. 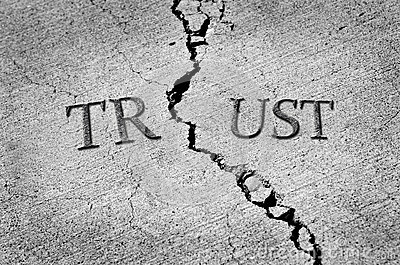 So, despite how much we want and should trust law enforcement, how can we trust them, when we feel they don’t trust us? Ultimately, Plato concluded that the “noble lie” told to to the guardian class to keep them responsible has to be believed. If it’s not then it would lead to an eventual breakdown of trust between the guardians and those they guard. If they believe this noble lie, whether that it’s given to them by the guarded or an ethical or moral reason for that belief, power will be reserved. However, if they do not believe it, they won’t have a distaste for power. They will crave it. If Black America believes that law enforcement has no responsibility to their power and in a sense do not believe their “noble lie”, Plato describe a growing divide in tensions between the two classes, which ultimately leads to a complete loss of trust. If that were to happen, then a society, no matter how great, will not be able to survive. Especially when the authority is in question. This was from the autopsy report done by world renown pathologist, Michael Baden. 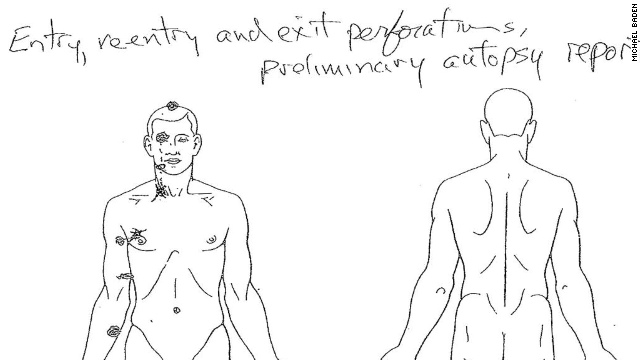 The official autopsy shows an additional wound grazing the right thumb of Michael Brown. Officer Darren Wilson who shot to death Michael Brown he testified(more on that in a minute) that Michael Brown confronted him at his SUV window punching him twice(that made his face look like he was in 30 degree weather for a few minutes(after being punched in the face by someone that outweighed you by 70 pounds(with the intentions of killing you))), lunged for his firearm on the right side of his body and after discharging a round(into himself), Michael Brown ran away, thus ending any credible threat to Wilson’s life. When Wilson exited his vehicle, firing twice more at a fleeing Michael Brown, Brown then stopped turned back to Wilson and charged forward with his right hand under his shirt, which left Wilson with no other choice but to shoot Brown to death, including twice in the head. That’s Wilson’s account. And since the Grand Jury came to the decision to not find probable cause for an indictment, a lot of attention has been given to the thumb wound, which would support Wilson’s story, and the two headshots(for a total of three combined wounds). What I find more curious and tragically ignored are the THREE other shots that were inflicted on Michael Brown’s Body. For the last week I learned that Facebook has more forensics experts than I originally imagined. However, the one thing they never explain to me if Michael Brown was “charging” at Darren Wilson or took a step towards Wilson with his right arm reaching for his belt line, HOW IN THE HELL DOES HE GET SHOT THREE TIMES ON THE INNER RIGHT ARM?! If you’re reading this, look at the picture again. Now try re-enacting either of what Darren Wilson is claiming. Try running forward…. Finished? Now take you right hand and grab your belt…. Did that too? Good. Now tell me how is it humanly possible for either three of those arm wounds to happen doing either action you just did?! One more quick exercise: Put your hands in the air… NOW TELL ME WHICH PART OF YOUR BODY IS READILY EXPOSED TO BE SHOT? No, I’m not a forensics expert. I just like using common sense, which this Grand Jury didn’t use. Speaking of this jury. Now, I don’t know what the jury was comprised of or who believed what, but I’m almost positive that the decision to not indict was not unanimous. And honestly, it didn’t have to be. Why? BECAUSE THIS WAS NOT A TRIAL JURY! Darren Wilson was not on trial. The witnesses did not have proper representation or advocacy. The evidence wasn’t examined and re-examined. This was a GRAND JURY. A grand jury is used by a prosecutor to get an indictment so there can BE a trial. However, forensics experts of Facebook takes this decision as a full trial and adjudication of all evidence and acquittal for Darren Wilson. “The evidence clearly shows”, I’ve heard far too often. NO, THE EVIDENCE DOES NOT CLEARLY SHOW! The Grand jury was given over SIXTY witnesses. Barely any of them had COMPLETELY consistent accounts of what happened step for step. Even the forensics, ran independently and by Saint Louis County, aren’t entirely consistent. So anyone who says the “evidence clearly shows” anything, HAS NO %#&@ING CLUE WHAT THEY’RE TALKING ABOUT! They need to keep quiet and stay in their lane. Speaking of others who need to stay in their lane: Robert McCulloch! Robert McCulloch who’s father was a police officer that was shot and killed in the line of duty, was expected to objectively prosecute Darren Wilson. He’s the County Prosecutor. His job: prosecute. It’s actually in his job title. His goal is to get an indictment TO prosecute. Like with over 162,000 U.S. attorneys in 2010 seeking an indictment and only having 11 declining such an indictment. That’s not even one half of one half of one half of one percent. In other words when a prosecutor wants an indictment, they get their indictment. Why? Because it’s their job to get an indictment. They don’t have to give a exhaustive list of witnesses to a grand jury. They don’t have to tell the defendant’s side of the story. They’re suppose to be prosecuting the defendant. An indictment is a one-side formality. A prosecutor’s job is to go to a grand jury just to get an indictment. Not to give a grand jury reason to not give you your indictment that you’re SUPPOSE to get. I would say that’s doing a really poor job at being a prosecutor, but I have no choice but to believe that Robert McCulloch wasn’t doing the job he was elected to do. So there it is. I really want to be done with this. And by done with this I mean STOP SEEING UNARMED BLACK PEOPLE SHOT under absolutely dubious circumstances. At the very least, be done with gullible people who are seemingly looking for a reason to not use logic. Really, if I’m wrong. I’m wrong about this, but I really wish someone would show me where. Until then, stop making idiotic assumptions. Your name is not Michael Brown. Your name is not Darren Wilson. No one is accusing you of murder. Here’s what I would like for us to talk about. How shooting anyone six times, whether their hands are in the air or retreating to just get a running start to charge at you, is a PISS POOR way to detain a suspect. I don’t care what side you fall on. Let’s talk about better policing. Let’s talk about police working in communities, adopting a community and the people. Get to know the families and the children and what’s going on in their lives and be complete PUBLIC SERVANTS. That way, you’ll recognize them as human beings and less likely to fire at someone’s child. Let’s talk about police not only hold themselves and their authority accountable, but them wanting to show the world that they can be trusted and safe and fair by wearing body cameras and carrying non-lethal weaponry. Let’s recognize that while the police wants our communities to trust them so they can do their jobs, they need to make the effort to extend the olive branch and BE worthy of our trust. It’s a two-way street. We want better police. The police should expect the best and give the best. That way we don’t have to continue to have these things happen. AND STOP PRETENDING BAD POLICE DON’T EXIST AND BLACK MEN JUST HAVE IT COMING! Back to your regularly scheduled Friendly Neighborhood Black Man.